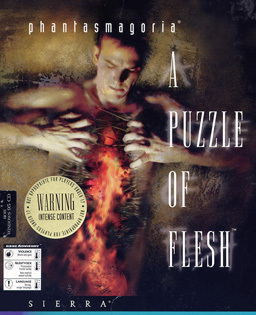 Phantasmagoria: A Puzzle of Flesh, or Phantasmagoria 2, is a survival horror, point-and-click, interactive movie game. The game follows the protagonist Curtis Craig who is trying to deal with his past and current hallucinations while investigating mysterious murders that happen around him. The game was censored and banned in many European and Oceanic countries for its violent and sexual content.